Observations covering the past few decades have shown a decline in the rate at which the Earth’s surface has been warming (see Figure 1). Yet recent research involving the University of Reading, the Met Office and NASA shows that if anything the Earth is gaining heat at an increasing rate. How can this be the case? Figure 1. 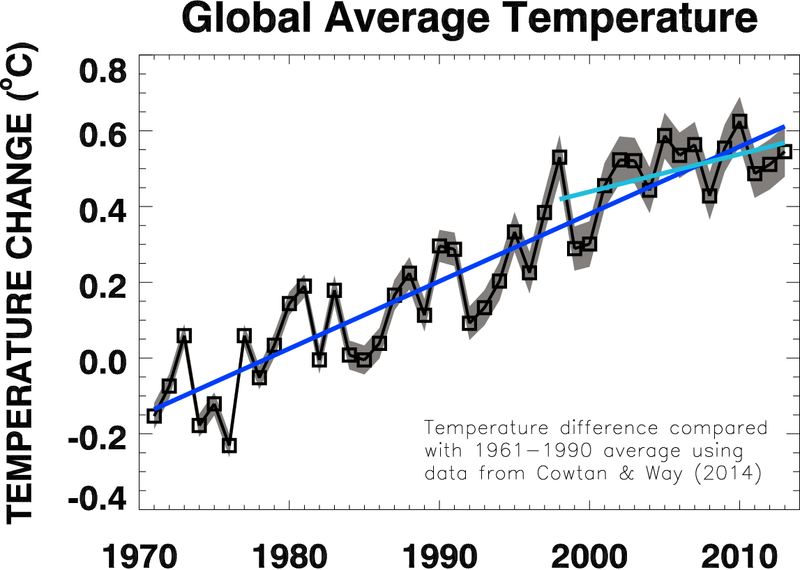 Observed changes in global annual average surface temperature relative to 1961-1990 from the HadCRUTv4 dataset which is updated to account for gaps in data coverage (version 2.0 Long Reconstruction). As we all know from boiling up our pan of vegetables for dinner, you have to put in quite a bit of energy to raise the temperature of water: approximately 4000 Joules of energy to heat a kilogram of water by 1 degree Celsius. And it turns out that Earth’s capacity to take up heat is primarily determined by our vast oceans, all 1.4 billion billion tons of them (1.4×10^21 kg). So what explains the diminishing rate of surface warming? A number of small volcanic eruptions (which act to make the planet more reflective) and a slightly weaker sun in the 2000s compared to the late 1990s are thought to have offset some of the heating effect of rising greenhouse gas concentrations. 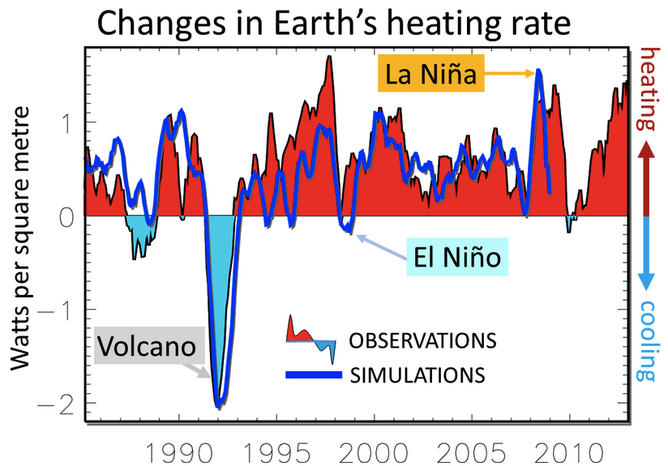 However, our recent analysis of satellite data, ocean measurements and detailed simulations (see illustration) indicates that Earth’s heating rate has not diminished over the period 1985-2012. And if anything it has increased. Currently heat is accumulating at a rate approximately equivalent to every person worldwide using 20 kettles each to continuously boil the oceans. That’s a big tea party. Recent research indicates that natural fluctuations within the ocean are stealing some of this accumulating heat from the surface layers thereby depriving the atmosphere of the ocean surface warmth. Changes in the Pacific and Atlantic oceans have been implicated as the prime suspects. In such a complicated system it can, however, be all too easy to conclude that the tail is wagging the dog and research is continuing to refine our understanding of the precise mechanisms at play and the wider impacts on weather patterns. It has long been known that surface temperatures will not rise smoothly in response to increasing greenhouse gas concentrations; other heating and cooling factors including changes in the sun, volcanic eruptions and particle “aerosol” pollution influence Earth’s overall current heating rate. And natural fluctuations within our vast oceans from one decade to the next determine what proportion of that heat warms the surface layers, which influence atmospheric temperatures, and what part is gobbled up by deeper levels. Understanding these processes is vital in gauging the likely future rates of global and regional warming associated with human activities, important for how we plan for and adapt to future climate change. These are important topics of research being tackled here by members of the University of Reading’s Walker Institute and Meteorology department and worldwide as detailed in the latest assement by the Intergovernmental Panel on Climate Change. A more detailed discussion and a growing list of journal articles discussing aspects of the slowdown in global average surface warming are available on the NERC-funded DEEP-C project website. This entry was posted in Climate, Climate change, IPCC, Volcanoes and tagged climate change, warming pause. Bookmark the permalink.